I noted several months ago that, for the first time in recorded history, women’s payroll employment might surpass men’s during this recession. This July women held 49.9 percent of all payroll jobs, and some recent research by Federal Reserve economists gives a sense of whether the current trend — heading toward a female-majority work force — will continue. Obviously, millions of jobs have been lost during this recession. These job losses have been especially concentrated in industries like manufacturing and construction, which disproportionately employ men. The sharp contraction in these male-dominated sectors is part of the reason that male employment has fallen much more than female employment during this recession, and that women, as a result, have increased their share of the work force. But with only the 49.9 percent figure, we do not know whether the high unemployment rate for men comes just because men are more likely to be laid off, or if it’s also because men are finding new jobs more slowly than women are. Aysegul Sahin and Joseph Song at the Federal Reserve Bank of New York and Bart Hobijn at the Federal Reserve Bank of San Francisco have examined job flows data that help assess the relative importance of these various explanations for our “mancession.” And indeed, the Fed researchers found that the main reason for the “mancession” is that so many more men than women lost their jobs — and not that women find new jobs more quickly. In any given month, the Labor Department considers every individual either employed, not employed but looking for a job, or neither (i.e., out of the labor force altogether). The reason that men and women remain unemployed about the same time is that unemployed men and unemployed women are pretty similar in terms of their rates of finding a new job. These flows help us predict whether women’s 49.9 percent share of payrolls will further increase, or ebb back. The implication: For the time being, women’s share of the work force seems to hinge primarily on continued contraction in manufacturing and construction. Why? As I explained, more men are searching for jobs and, so far, the average male job searcher has been about as successful as the average female searcher. Once the male-intensive industries slow down their layoffs (even if those industries never actually expand again), more men than women will gradually find new positions — remember that more men are searching — and we will see women’s share recede from the 50 percent mark again. A recent study reiterated the conclusion that population growth ought to be controlled in order to combat global warming, and other world problems. The authors of studies like these have exaggerated the benefits of population control, because they ignore some of the significant economic benefits of large populations -- in particular, the effect of population on the rate of technical change. "high population spurs technical change ... [historically] societies with larger initial populations have had faster technological change ...."
Michael Kremer (1993), "Population Growth and Technological Change: One Million B.C. to 1990," Quarterly Journal of Economics 108:3 (August), pp. 681-716. In case you're wondering, the populations considered by Professor Kremer were actually LESS educated than the populations that some want to control today. I have always suspected that this recession has proliferated private-sector-means-testing (and the bad incentives that go with means testing). Now I have proof. I write "The authors of studies like these have exaggerated the benefits of population control, because they ignore some of the significant economic benefits of large populations." Within hours it is claimed that I wrote "we shouldn't improve education and access to contraception in developing nations"! Shortly thereafter, it is repeated that I said that "we shouldn't improve education and access to contraception in developing nations." Obviously, it is too risky to rebut me directly -- ie, take the position that it is OK to ignore some of the significant economic benefits of large populations. But why not just ignore my point rather than fabricating something to discredit? While reasonable people can debate whether the effects of population on innovation are small (or even in the other direction) when compared with costs of population, don't the innovation effects have to be considered before coming to a conclusion? Where is the body of research that did this work? If it exists, why is it conspicuously absent from discussions by population control advocates? Apparently there are some really smart people out there who can secretly consider an effect like this, come to an accurate and private conclusion, and then brand as foolish anyone who publicly considers the effect (even without coming to a conclusion as to what is the net of all relevant effects). [Those coming here from Professor DeLong's blog may be wondering why he recommended Professor Kremer's paper to them a few months ago, yet now he vilifies someone for stating a weaker version of the same point, citing Professor Kremer's paper and others in that literature. A recent study reiterated the conclusion that population growth ought to be controlled in order to combat global warming, and other world problems. I beg to differ. The authors of studies like these have exaggerated the benefits of population control, because they ignore some of the significant economic benefits of large populations. This statement takes technology for granted, yet technology itself depends on population. Especially important among the sources of technical progress — discoveries — are trial and error, and incentives. Reasonable people can disagree about the relative importance of these two, but both are stimulated by population. The more people on earth, the greater the chance that one of them has an idea of how to improve alternative energies, or to mitigate the climate effects of carbon emissions. It takes only one person to have an idea that can benefit many. Plus, the more people on earth, the larger are the markets for new innovations. Thus, even if the brilliant innovators would be born regardless of population control, their incentives to devote effort toward finding new discoveries and bringing them to the marketplace depend on the size of that marketplace. And it’s clear that incentives matter for innovative activity: That’s why we have a patent system that helps innovators obtain financial rewards for their inventions. Not surprisingly, research has shown that market size stimulates innovative activity, as in the case of pharmaceutical research that is especially intense for conditions that have more victims. It may take a long time for population growth to either give birth to an inventor brilliant enough, or motivate enough incentives, to have an impact on the climate. But that’s not a reason to turn to population control, because it also takes a long time for population control’s impact to be noticeable. Although the calculations are inherently uncertain, the value of the additional innovation stimulated by additional population may be significant. In my academic work I have calculated that the value, to the entire marketplace through this channel, of an additional person may be on the same order of magnitude of the value that person places on his own life. For example, a person who can earn $2 million in his own lifetime may, by his presence in the worldwide marketplace, stimulate innovative activity that is worth a few hundred thousand dollars. The role of technical change has been repeatedly underestimated. For example, someone a century ago who claimed that the earth could have enough food to support nine billion people (population control advocates now think that the earth’s population can easily get there) would have been considered crazy. But with today’s technology it is easy to see how many billions can be fed. Some of the important solutions to climate change will also come from technological progress. 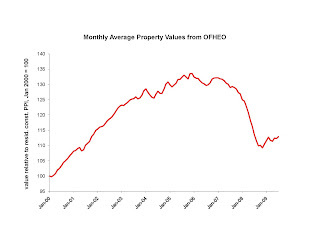 The OFHEO index for July was released today. The housing price data have been showing a housing recovery for a while -- the question is when construction activity will get back to normal. I went by Plum Island several times this summer and have been reading the novel Plum Island, which is about scientists on the island who study germs, viruses -- and how an accident or something sinister could result in human deaths. Unfortunately for a real scientist- from the Univ of Chicago no less -- a scenario like this actually happened. No Plum Island connection, as far as I know. 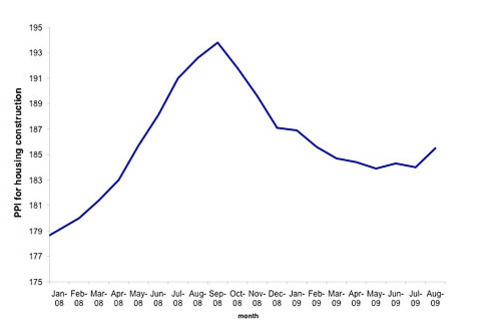 Housing permits and housing starts in August were higher than they were in any month since November 2008. A genuine housing recovery has to have a normal pace (the 2005 pace was not normal!) of housing construction. Yesterday the Bureau of Labor Statistics released its producer price index for residential construction. Its significant increase from July to August is a good sign for the housing market. The producer price index for single-unit residential construction measures the average change over time in the selling prices received by domestic producers of materials for houses. The chart below displays the index for each month of 2008 and 2009. The price index is of economic interest because it is an important determinant of the prices of existing homes. Few people want to pay more for an existing house than they would pay for having one built new. As a result, the housing P.P.I. is an important ingredient in economic forecasts of housing prices. For example, once it was clear that the housing “bubble” was over, it was (part of) the basis for my forecasts last fall of how far housing prices would ultimately fall (see also Edward Glaeser’s post). Additionally, the housing construction P.P.I. is more amenable to real-time analysis than are the housing price indices. For example, the Bureau of Labor Statistics releases its P.P.I. within about two weeks of the end of a given month, whereas the Case-Shiller index is not released for another two months. An end to the housing price decline is welcome because low housing prices are the main reason for the extraordinary prevalence of foreclosures. When housing prices fall, many homeowners owe more on their mortgage than their house is worth (that is, “their home equity is negative”), and even a homeowner with plenty of income can gain financially by letting the bank take his house rather than continuing to pay his mortgage in full. That’s why Stan Liebowitz, a professor at University of Texas, Dallas, found that negative equity was a more important factor than unemployment in causing the foreclosures, and why the researchers John D. Geanakoplos and Susan P. Koniak argued that foreclosures are “stunningly sensitive” to the amount of home equity. That’s one reason why it was good news yesterday to learn that the housing-materials P.P.I. was greater in August than it was in July. Once housing prices stabilize, homeowners will start to accumulate equity again, and we can eventually close the book on the foreclosure crisis. Professor Cochrane explains how Professor Krugman's contribution is disproportionate. "A Blog About the EconomY, not about EconomISTS"
"Is Macroeconomics Off Track? (How the Neoclassical Growth Model really is helpful for studying this recession)." Last fall I thought that there would be something like 1,000,000 mortgage modifications during this recession. That's big enough to matter in the aggregate employment statistics, but too little to explain but a minority of the job losses. Yesterday it was reported that 500,000 modifications will have occurred 1/1/2009-11/1/2009, which, when combined with the modifications of 2008 and modifications after 11/1/2009, should total a million or more. As reported by the sportseconomist. There seems to be concern that "incentives do not matter" is a "straw man." -- that nobody actually believes this, so that my raising the issue is just rhetorical smoke and mirrors rather than a rebuttal of a real-live argument. Some of the big government advocates are too smart to come out and say "incentives do not matter." But it is true that incentives are conspicuously absent from their public policy commentary and design, especially as it relates to the so-called fiscal stimulus. Why would someone who genuinely believes that incentives matter, build into mortgage modification marginal tax rates that exceed 100%? Why would they do so without out even commenting on why they think 100+% tax rates are OK in this instance? If incentives really mattered, why did the Obama Administration's stimulus bill analysis neglect to indicate how the bill (either in the form of spending or "tax cuts") would affect incentives to work and to earn? If incentives really mattered, why did the Obama Administration's stimulus bill analysis choose "multipliers" from the economics literature without even a cursory mention of whether the stimulus bill's effects on the incentives to work and earn would be similar to the government spending episodes studied in the literature? When Professor Krugman wrote about the stimulus (e.g., here, here, and here), he did not devote even one sentence to the incentives that would be created by the federal spending. If he thought incentives mattered, why is lots of attention devoted to "multipliers" and none to incentives? I never blamed the entire recession on unemployment insurance, or on mortgage modification, or even the combination of the two. Moreover, I have repeatedly been clear (e.g., here -- the paragraph that starts "To be clear", and here) that we would have had some kind of recession even if government had not destroyed incentives. I never said that unemployment insurance is wrong. I called it "compassionate, but inefficient" and a minor contributor to the overall bad incentives created by our government during this recession. With that said, I appreciate any citation, no matter how distorted it may be! The fundamental result of economics is that incentives matter. These laws of economics constrain public policy dreams, but show no signs of bending or breaking. When non-economists get their first glimpses of economics, they often see an apparent reliance on an assumption that “market participants are fully rational,” and some of them react by dismissing economic analysis. But the rationality assumption has little to do with the fundamental result that incentives matter. Incentives, rather than rationality, have been the basis for essentially all of my blog posts, including this one, this one, this one and this one. One of the core components of Ph.D. training in economic theory is the article “Irrational Behavior and Economic Theory,” published by the Nobel laureate Gary S. Becker in 1962. The article shows how the market would likely respond to incentives – and respond significantly – even if the individual participants were impulsive and habitual. To see how incentives matter even when consumers are irrational, consider a toy model of the market for alcoholic beverages. In this model, half of people are teetotalers and consume no alcoholic beverages, regardless of what prices might prevail in the market. The other half of the population are alcoholics and “irrationally” spend all of their discretionary income on alcoholic beverages, also regardless of what prices might prevail in the market. Now introduce a liquor tax that doubles the price a consumer must pay for each of his alcoholic beverages. Not surprisingly, the teetotalers do not respond by drinking less, because they would not drink regardless. The alcoholics, however, must cut their drinking in half because they have no more discretionary income to increase their expenditures on alcoholic beverages. More generally, a liquor tax hits the heavy drinkers the most, and they are the ones for whom necessity (that is, the fact that one’s income is limited) alone may cause them to consume less. As an empirical matter, our economic history is full of evidence that incentives matter. Taxes discourage activity in the market taxed by raising prices paid by consumers, and subsidies encourage it by lowering the prices paid by consumers. Yet, ever since last year’s financial crisis, an outspoken group of economists have essentially been telling us that incentives do not matter. The fundamental result of economics tells us, among other things, that the employment and gross domestic product impacts of fiscal policy depend critically on whether policy creates, or destroys, incentives for work and the earning of income. Nevertheless, we are told that massive federal government spending is guaranteed to stimulate the economy, even if it were wastefully spent and destroyed incentives to work, as programs like unemployment benefits and mortgage modifications do. Additionally, anyone who might bring an analysis of incentives to the policy debate is branded “foolish,” “blind,” “crazy” and “seduced by a vision of a perfect, frictionless market system.” To many advocating more government intervention in the economy, a proper analysis of the fiscal stimulus law, and other matters of the day, would completely ignore the incentives created by public policy. Yet only one reason – that market participants are irrational – has been given for their sudden, wholesale rejection of the fundamental result of economics. Even if they can muster evidence for their irrationality hypothesis — perhaps the events of 2008 will ultimately be interpreted that way — they ought to know that this theory cannot deny the reality that incentives matter, even when rationality is limited. Until then, they will continue to be surprised by how bright public policy promises are followed by dismal performances. Like me, you may have noticed that a significant amount of "economics" commentary has little to do with the economy (how people on earth manage its scarce resources), and much more about economists (the small group of people dedicated to studying how people on earth manage its scarce resources). Reading that commentary, you can learn who among the economists are "foolish", "crazy", and perhaps even which of them qualifies as the "stupidest man alive." I have nothing public to say about that subject, because I have no expertise in judging the thought processes of particular individuals (or thought processes more generally). I took dozens of courses, and have published dozens of articles, about various aspects of the economY, but never encountered a course that would even introduce me to the subject of economISTS and their individual thought processes. It is true that I regularly interact with a special group of economists -- serve on committees with them, or attempt to convince a couple of them to publish one of my papers -- and that presents opportunities to opine on individual thought processes. But that is invariably an amateur affair, and I (and they) have found that results are better the more I stick to putting forward my best analysis of the economY. For these reasons, I must disappoint those readers of this blog who would like to me enter the market for commentary about economISTS. I will stick with the economY, in rough proportion to the size of the various sectors (as such, economISTS are entitled to approximately 1/2000th of my attention). The household survey shows SA employment falling about 400,000. Seasonally unadjusted, it fell almost 1 million, 700,000 of which was among teenagers. This reflects the normal seasonal, plus perhaps some effects of the minimum wage hike that went into effect in July. The BLS reported this morning that payrolls were 49.9 percent female in July 2009. To my knowledge, I was the first economist to follow this statistic (see this post from January). I also predicted that, if the recession were deep enough (which I defined to be total payrolls below 131 million, seasonally adjusted), then women would hold a majority of payroll positions. I wasn't sure whether total employment would be deep enough (that is, below 131 million), but thought it could happen in August 2009. Interestingly, July 2009 payrolls were 131.2 million. With the additional data that has become available since then, it seems possible that payrolls could drop below 131 million and women become a majority in October or November. But my original forecast is somewhat more likely "total employment may never get as low as 131 million, and the female percentage may not reach a full 50 percent for several years." NOTE: the seasonally UNadjusted data say that women's percentage peaked at 49.98 percent in March 2009. Even if the SA data say that women attain majority this fall, they will not really be a majority because their peak occurred in a male-intensive season. (HT to Dennis Cauchon, even though he misquoted me!). Residential construction employment fell (seasonally adjusted), although much less than it has been falling. I cannot say that we have all of the pieces of a housing recovery until that employment actually increases. Senator Edward M. Kennedy’s death last week may mark the passing of one of America’s great political dynasties — and an occasion to examine what such dynasties reveal about the state of competition in the electoral marketplace. Aside from Senator Kennedy and his brothers (and their offspring who have also held office), the dynasties have included the Bushes (a senator, two presidents and a governor over three generations), the Clintons (a president and a near-presidential nominee) and the Daleys of Chicago (two longtime mayors and a Cabinet secretary). It is difficult to attain high political offices, so it is no surprise that those offices are held by special people with unique talents. But generational inheritance is not so strong that the genes and life experiences that put, say, George H.W. Bush in the Oval Office ahead of millions of other qualified people would be replicated closely enough by his son that he too would finish first in the same political race. From an economic point of view, political dynasties suggest that the competition for public office is less than perfect. Might there be obstacles and barriers that prevent the success of superior candidates? One test that economists use when addressing this question in the private sector — that is, determining whether a large producer maintains its market dominance by blocking competition rather than enticing the consumer — is a test for excess profits. If a large producer both faces little competition and earns profits that seem to exceed a market return to its effort and unique assets (broadly defined), then it may be blocking competition. Another may be the ability of such a dynasty to survive scandals — Mayor Richard M. Daley has been surrounded by them — and perpetuate its dominance, even as some argue that it is above the law. But President Obama’s victory last year suggests that political dynasties still have to compete with talented newcomers.